A tornado is a rapidly rotating column of air that is in contact with both the surface of the Earth and a cumulonimbus cloud or, in rare cases, the base of a cumulus cloud. They are often referred to as twisters, whirlwinds or cyclones, although the word cyclone is used in meteorology to name a weather system with a low-pressure area in the center around which winds blow counterclockwise in the Northern Hemisphere and clockwise in the Southern. 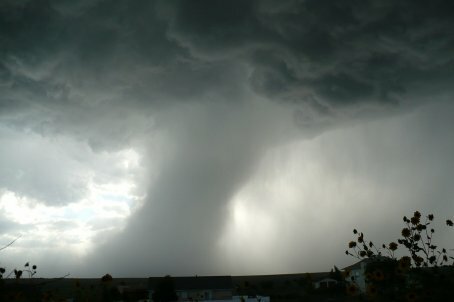 Tornadoes come in many shapes and sizes, and they are often visible in the form of a condensation funnel originating from the base of a cumulonimbus cloud, with a cloud of rotating debris and dust beneath it. Most tornadoes have wind speeds less than 110 miles per hour (180 km/h), are about 250 feet (80 m) across, and travel a few miles (several kilometers) before dissipating. The most extreme tornadoes can attain wind speeds of more than 300 miles per hour (480 km/h), are more than two miles (3 km) in diameter, and stay on the ground for dozens of miles (more than 100 km). There are several scales for rating the strength of tornadoes. The Fujita scale rates tornadoes by damage caused and has been replaced in some countries by the updated Enhanced Fujita Scale. An F0 or EF0 tornado, the weakest category, damages trees, but not substantial structures. An F5 or EF5 tornado, the strongest category, rips buildings off their foundations and can deform large skyscrapers. Doppler radar data, photogrammetry, and ground swirl patterns (cycloidal marks) may also be analyzed to determine intensity and assign a rating.